This story has been translated and edited from the original Spanish version. After the deaths of more than twenty infants so far this year in Nevada, authorities are warning the community about a silent killer that could lie in their own homes: so-called crib death. “Crib death,” also known as SIDS, is the sudden and unexplained death of an apparently healthy infant under one year of age. It occurs most commonly in babies between the age of two and four months. While SIDS occurs during sleep, pediatricians say there are factors that increase the risk, such as sharing a bed with a baby, or what is known as co-sleeping. For many new parents, co-sleeping — the practice of sleeping in the same bed with their baby — is an opportunity to maintain warmth and closeness, but it may also be because they can’t afford a crib or an extra bedroom at home. One recent study found that nearly two-thirds of new parents reported sharing a bed with their baby even though experts discourage the practice. Another showed that co-sleeping is more common among black and Hispanic mothers than white mothers. The American Academy of Pediatrics (AAP) warns that when sleeping in the same bed with parents, babies are at risk of suffocating or being strangled, falling, or being trapped between the bed and walls. Parents can also turn over onto their sleeping babies or infants can become tangled in the sheets or blankets. 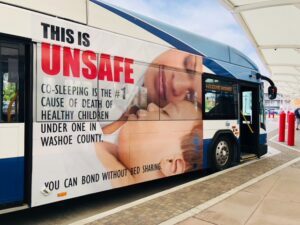 Nevada’s incoming governor has offered one possible policy recommendation to promote safe sleeping practices, and authorities in Northern Nevada have gone so far as plastering public buses with messages about best practices. “We’re taking a proactive focus to get directly to parents, relatives and caretakers with the necessary information and recommendations about how to provide a safer environment for sleeping,” said Chris Ciarlo, spokesman for the Washoe County Human Services Agency. In the United States, there are nearly 3,500 infant deaths each year related to sleep, the Center for Disease Control and Prevention reported. The causes of these deaths includes Sudden Infant Death Syndrome (SIDS), accidental suffocation and death from unknown causes. A study published in August 2014 in the journal Pediatrics examined infant deaths related to sleep patterns in 24 states from 2004 to 2012. It revealed that of the 8,207 deaths analyzed, 69 percent of infants shared a bed with someone at their time of death. To raise public awareness about sleeping dangers for children, Las Vegas police held a press conference at Sunrise Children’s Hospital last month. The agency noted that so far this year, their Child Abuse and Neglect Division investigated the deaths of 23 infants under the age of 1, including five deaths in the month of October alone. Aden Ocampo, a spokesman for the LVMPD, added that the agency investigated 25 cases of deaths of infants who passed away while they slept in 2017. That’s a total of 48 cases in the past two years. Justin Norton, a spokesman for the Washoe County Regional Medical Examiner’s Office, told The Nevada Independent en Español that in 2017 there was one death reported. The number increased with four autopsies conducted during the 2018 calendar year; all the examinations pointed to sleep-related causes and all involved children under the age of 2. In Northern Nevada, an extensive campaign was launched in October to raise awareness about SIDS, the leading cause of death in babies younger than a year in Washoe County. 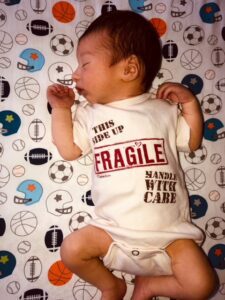 The campaign consists of 50 bulletins and billboards, three public buses plastered with the message, social media and the distribution of onesies with the message “Fragile” and “Handle With Care” in reference to the precautions that people should follow when putting a baby to sleep. Ciarlo said in an interview that state funds invested in this campaign were used to maximize the reach of the message. “We know that the best and safest way to put a baby to sleep is on its back, alone, in its crib,” he said. The efforts of pediatricians and authorities across the country to discourage the practice of sleeping with babies in the same bed has hit some resistance from parents who argue that the practice conveys a sense of safety and fosters strong emotional ties. 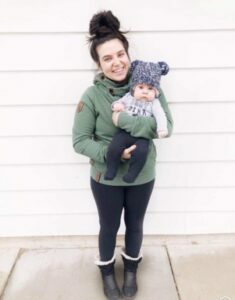 Mackenzie Storck, a first-time mom with a 4-month-old baby, said in a telephone interview with The Nevada Independent en Español that she felt safer sleeping in the same bed with her daughter. Storck acknowledged that she felt worried and hesitated before deciding to sleep with her baby because she knew about SIDS, but added that after trying several products she felt it was best for both parents to sleep with their baby. The first-time mother said she takes several precautionary steps when she sleeps with her baby, and she makes sure the covers aren’t close to the girl’s face, that she doesn’t have any pillows nearby and that she has adequate space in the bed. 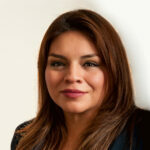 Storck added that over time she has learned her baby’s sleeping patterns and feels less stress during the night. In addition to highlighting the importance of following the recommendations of the AAP, Fitzpatrick added that although babies should sleep alone in their crib, it is important that the bed is kept in the parents’ room so they can keep an eye on their children. There are a variety of products on the market that increase baby safety, including portable cribs that can be placed right next to the larger bed or special beds known as sleepers which are placed in the middle of the bed. The prices of these items vary depending on the size, brand, and whether the item is purchased new or secondhand. Retail sites generally sell them for between $35 and $365. A report from the CDC this year pointed out that both the states and health-care providers play a key role in promoting these recommendations from the AAP. The report said that models used in other states can be adopted to improve safe sleeping practices, as well as continuing preventive communication campaigns and programs in hospitals, Women, Infants and Children (WIC) Nutrition Clinics, and home visits. The issue even trickled down to the Nevada governor’s race this fall. During his campaign, governor-elect Steve Sisolak unveiled a health platform that seeks to reduce maternal and infant mortality rates and included a pilot program called “baby boxes.” The idea, common in Finland, involves giving prospective parents baby items and educational materials packaged in a box that can double as a bassinet. Another program, conceived in 2011, is helping parents that do not have a crib and are facing financial strain. Cribs for Kids was originally launched in Northern Nevada but is now available statewide. Francisco Ceballos, the program coordinator of Cribs for Kids, said that parents with infants who are under 6 months of age or expectant mothers are eligible for this program which offers a Pack and Play at no cost.